Ukrainian President Petro Poroshenko has ordered top military officers to take measures in connection with the illegal detainments and inspections of Ukrainian and foreign vessels going to the Azov Sea ports. 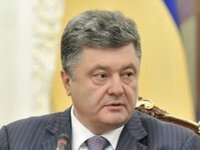 "Today I gave corresponding orders to the Minister of Defense, the Chief of the General Staff, and the Commander of the Ukrainian Navy, so that we take the necessary measures to stop these violations of the law and stop Russian provocations during passage of Ukraine's Kerch Strait," Poroshenko said on Monday evening during the Freedom of Speech program aired on ICTV channel. He said that Ukraine will strengthen protection from the sea. "And we will not tolerate the illegal seizure of Ukrainian and foreign ships that are moving towards Ukrainian ports, including Mariupol," the president said. According to Poroshenko, Russia's goal is to shut down Ukraine's mining industry in eastern Ukraine. All information placed on this Web site is designed for internal use only. Its reproduction or distribution in any form is prohibited without the written permission from Interfax-Ukraine.